IMPORTANT! 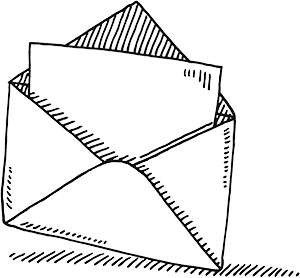 Any packages over and above your personal copy can be assigned to a student. 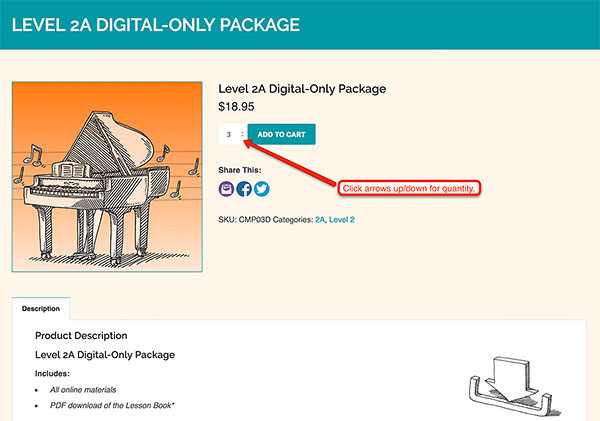 You must have a copy of a level in your OWN account (even if it’s a free promo copy) in order to purchase multiple levels for students. 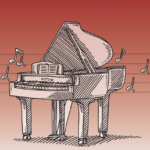 Sign up for frequent teacher specials and discounts by clicking here. 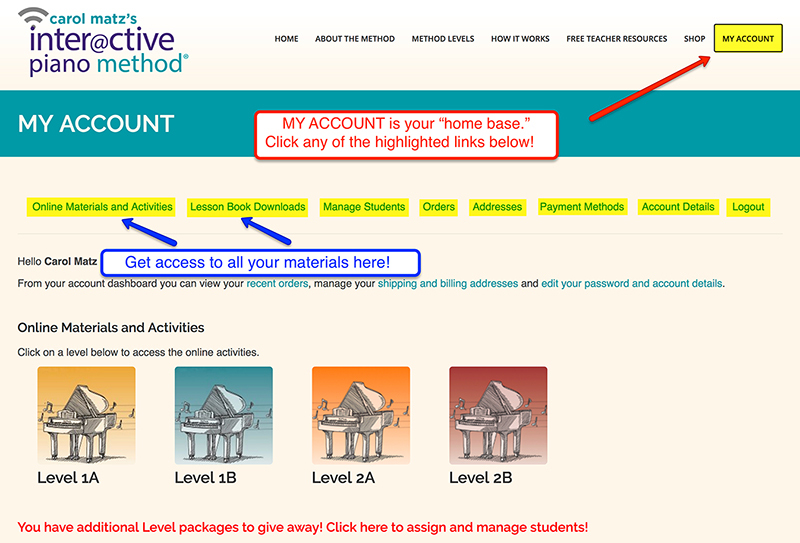 You can always find all your materials under “My Account” in the upper right of the website. Think of this as your “home base” or account dashboard. 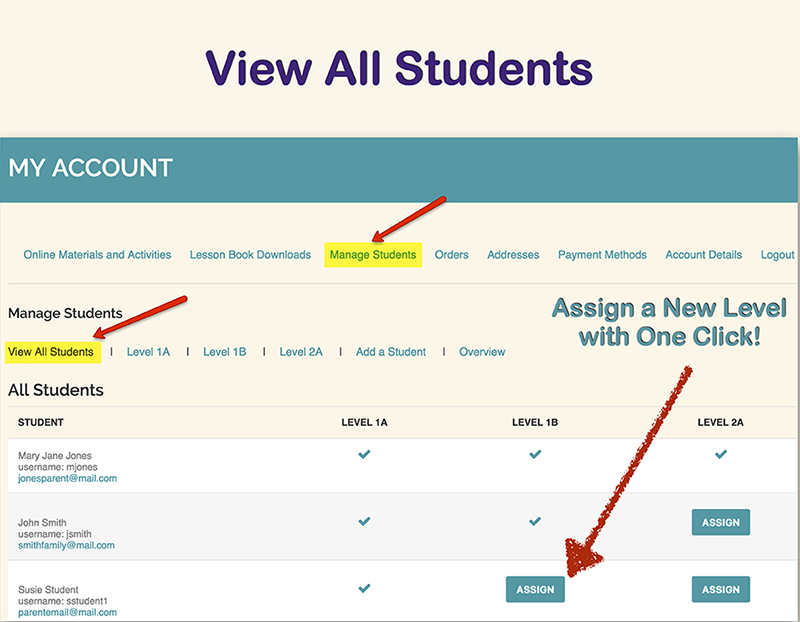 One of the options under “My Account” is “Manage Students.” Here you can ADD A STUDENT (create an account for them using a parent email) and assign the student a level. 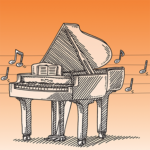 I recommend purchasing packages FOR your students, and creating ONE studio password, like “Pianolessons88” etc., and ask parents not to reset the password. 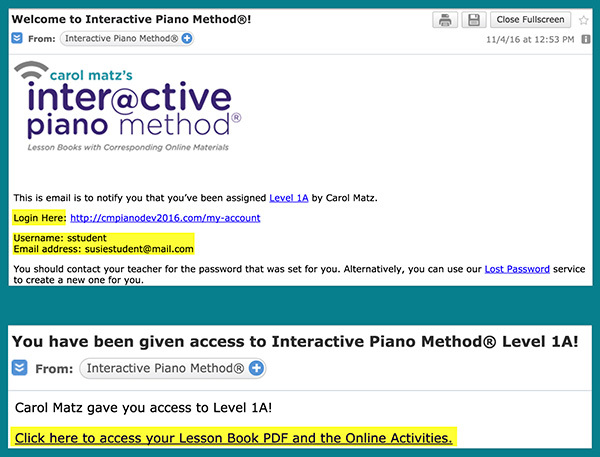 This way, you can easily log into the student’s account during the lesson. Also under “Manage Students,” you can view all of your assigned students, including their usernames, email addresses, and which levels have been assigned to them. 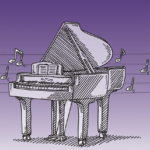 Once a student is added to your account, you can assign all future levels with one click! 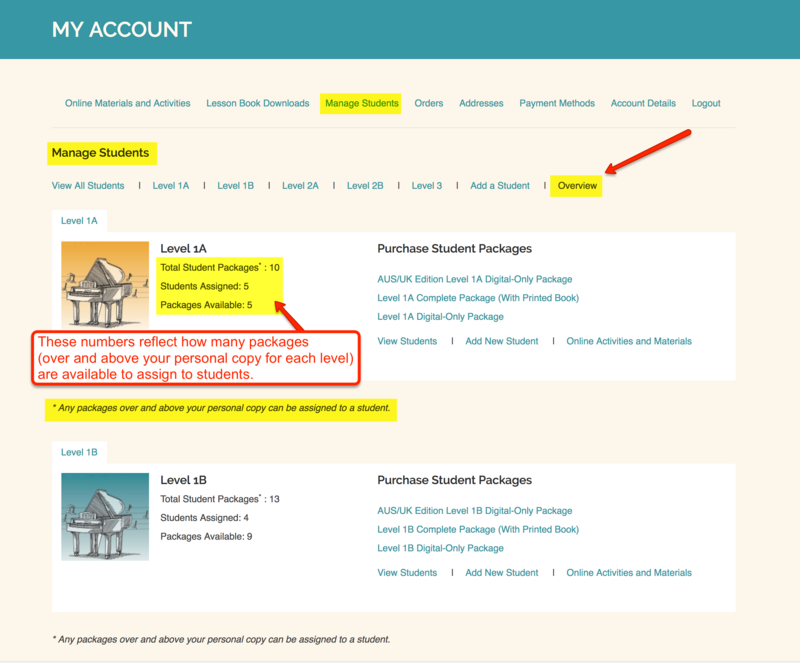 When you click “Overview” within the “Manage Students” section, you’ll see how many packages (over and above your personal copy) are available to assign to students. Select quantities of each level and add to your cart. 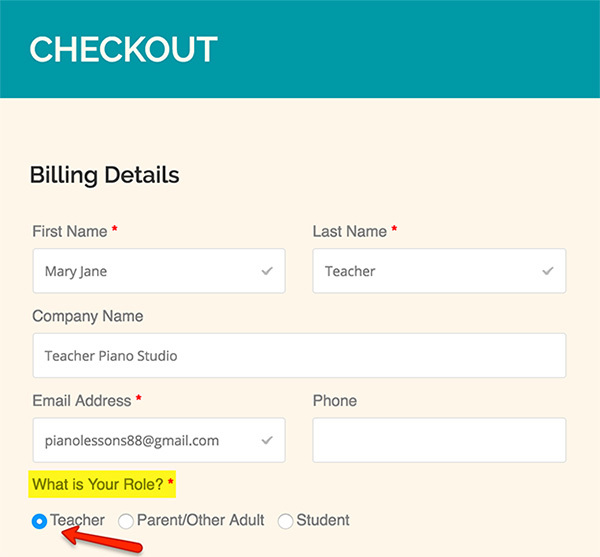 During checkout, indicate your role (teacher, parent, etc.) 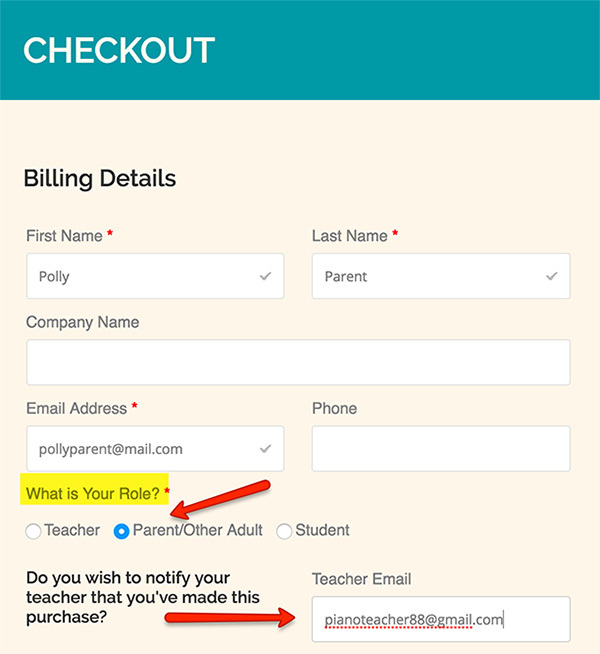 Notice that a parent who purchases may notify the teacher of the purchase via email. A receipt will be emailed to you. BE SURE TO CHECK YOUR SPAM FOLDER. 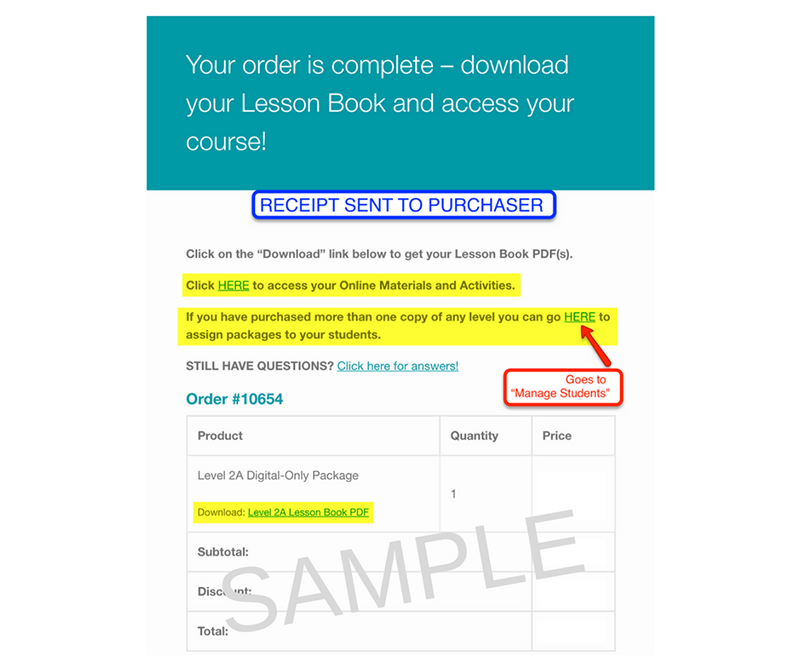 → Your receipt contains a link to download the Lesson Book PDF, plus a link to access the Online Materials and Activities. 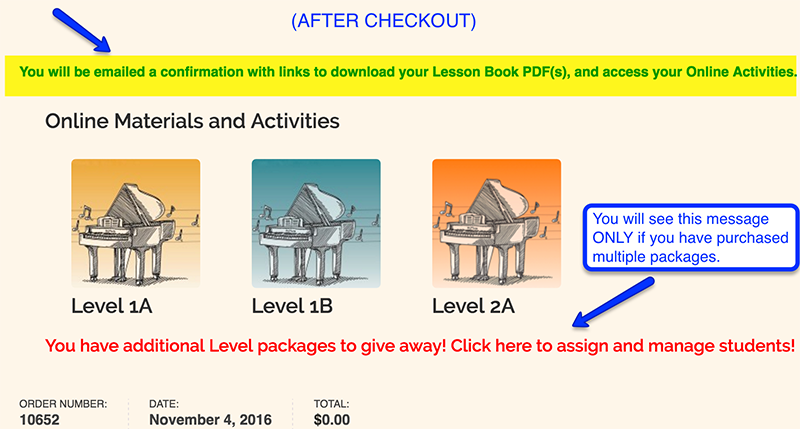 → If you’ve purchased multiple copies of any one level, you’ll also see a place to click to assign packages (levels) to your students. This leads to the “Manage Students” section. 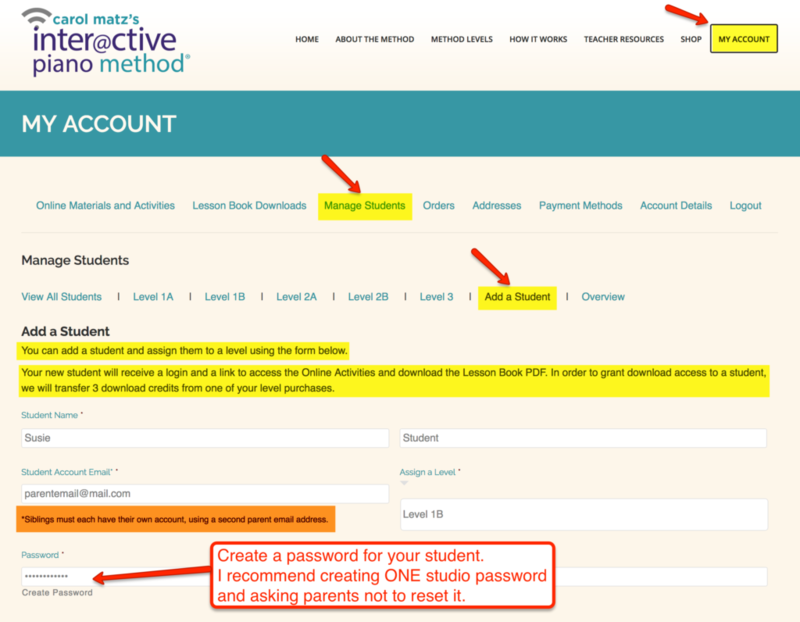 Once you assign a package (level) to a student, the parent and student will be notified via email. 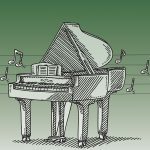 They will be sent: 1) a link to login; 2) a username; and 3) a link to access the Lesson Book PDF and the Online Materials and Activities.